Traditionally, cyclists’ training has involved three things: 1) ride your bike, 2) ride your bike and 3) ride your bike some more. However, it can be very difficult to improve the strength and control of a specific muscle group responsible for a part of your pedalling just by riding the bike. 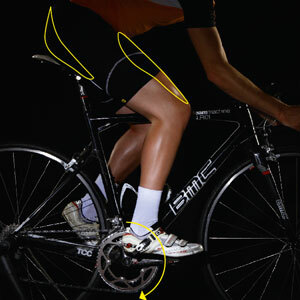 The pedal stroke can be broken down into four phases, with different muscles responsible for each phase. Weight training is a very time-efficient way specifically to strengthen these muscles. Cycling is a single-leg activity; while one leg is pushing through the power stroke, the other leg is doing the opposite action. Therefore, it is important to train using single-leg exercises that encourage independent activation and challenge the body’s core control. To develop control and muscular endurance, the exercises can be performed just using body weight. A slow tempo is important to develop control of the movement (four seconds down, hold for two seconds at the bottom, push up quickly). Two-three sets with high repetitions (12 to 15 repetitions) with 90 seconds’ rest between sets will help to develop endurance. To increase strength and muscular activation, the exercises can be loaded with dumbbells in the hands or a bar across the shoulders. Perform three-five sets with fewer repetitions (three-five) but with longer rests between sets (three-five minutes) and at a higher tempo (two down, two up). It’s also a good idea to have your bike set up on a turbo and gently ride between sets to remind your legs where and how you’ll integrate each exercise back into the pedal stroke. Target: Drive pedal forward over the top of the stroke and start to push down. Step forward, keep the chest up, drive the knee over the foot and drop the back knee down until it nearly touches the ground. Push down and back through the heel of the front foot to return to the starting position. Step back with the non-exercising leg and keep your weight going down through the heel of the forward support leg. Drop hips straight down, until the rear knee almost touches the floor. Squeeze the glutes and push straight down through the heel of the front leg to return to the start position. Target: Scrape the pedal quickly through the bottom of the pedal stroke so the other side gets onto the power stroke more quickly. Start holding the bar in front and pinch the shoulder blades back and down, keeping the back straight throughout. Stand on one leg, sway the hips back and bend the knees slightly. Slide the weight down the front of the thighs towards the ground, squeezing the glutes to control the descent with your weight through your heel. Drive through the glutes to return to a standing position. Target: Continue to rearward travel of the pedal and reduce the resistance on the pedal as it travels up the back of the pedal stroke. Exercise: Single leg Swiss ball hamstring curl. Lie on your back with your heels on a Swiss ball, knees bent at 90°. Squeeze your glutes, push the hips up off the ground, balancing on the shoulders, and straighten one leg. Extend the support foot out until the knee is nearly straight. Return leg to the start position. Keep your core contracted and glutes squeezed throughout. Body imbalance: Are you pedalling symmetrically?